As far as I am concerned – yellow-skinned apples are better set aside for other varieties. 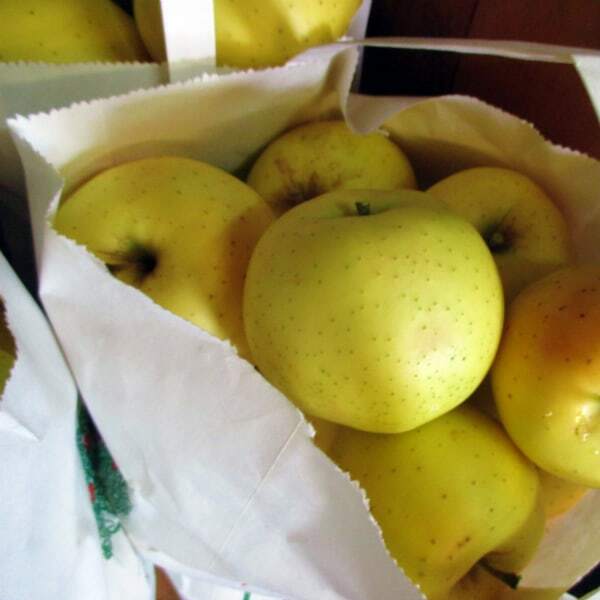 A lot of us are use to store bought Golden Delicious apples that are soft, mealy, and flavorless, available year around. I am always on the look out for new yellow apples to try. Last week during my trip to New York, I made a pit stop at Sage’s Apples in Chardon, Ohio. I wanted to try one of their yellow apples – the Honeygold. One interesting tidbit aboout the Honeygold apple is that people use to think it was one of the parents of the Honeycrisp. Seems to make sense. Both have the word “honey” in their names and Honeycrisp is part yellow itself. That was proven to be false. What is true though is that both those apples were developed at the University of Minnesota. 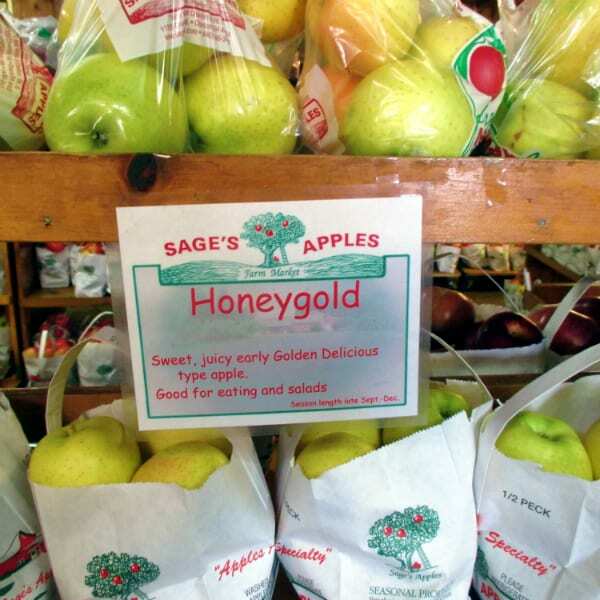 Honeygold is a cross between a Golden Delicious and a Haralson. The goal they had in mind was to create an apple that was more cold hardy than the Golden Delicious – the mission was accomplished. Overall Feeling: A big fan of this apple. It has a nice crisp texture with good flavor. It is sweet, but with enough kick of tartness to keep it interesting. Another good, yellow-skinned apple that I enjoy. When my wife had it she immediately want to try it on a salad – which is what we did that night. Sliced it up into small pieces and put it on top of some spring mix along with Trader Joe’s Spiced Pumpkin seeds, and homemade white balsamic vinaigrette. Yes, we ate salad in our hotel room, on our vacation – now that’s eating like no one else!